Electric cars have been heralded as the way ahead for independent city travel and, in addition to their eco-credentials, being exempt from road tax and London congestion charges – as well as getting free parking in some parts of the country – the appeal is not hard to see. However, for all this, they remain something of a minor force in the wider spectrum of personal travel – so where is their advantage and why are so few of us driving them? 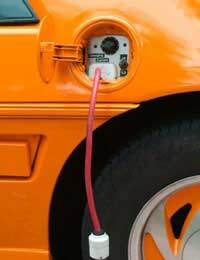 Electric cars obviously use electric motors, but unlike other electric vehicles such as trains and trams, they do not draw their power from a line, but require batteries to store the energy they use. Unfortunately, this has been a major limit on their development, both in terms of the difficulty of producing a battery with sufficient capacity for long distance travel and the need for it to be topped up from an external source. The net result has been a significantly restricted range – typically 70 to 100 miles – which makes electric cars useful in urban situations, but almost useless as substitutes for more conventional car trips. Drive is usually supplied to the car from a central electric motor, connected to the wheels via a standard-type transmission, although in some designs, each wheel has its own smaller, separate motor. Although electric cars ultimately derive their energy from the grid – which is itself largely powered by fossil fuels of one form or another – the innate efficiency of electric motors reduces many of the wasteful losses of normal vehicles. Working efficiently across the full range of operational speeds, the electric car avoids the need for a gearbox , while those with motors mounted in the wheels themselves eliminate transmission systems – and their attendant energy losses – altogether. In addition, like many trains and hybrid cars, electric vehicles can make use of regenerative braking, supplying energy back to the battery as the car slows down. The limited range of the current crop of electric cars has been seen as a major stumbling block to their wider uptake. A small number of public recharging points exist for electric vehicles – chiefly in and around London and the south east – but generally speaking, owners need to have somewhere to park them off-road and recharge them from a standard domestic socket. Consequently, with the weight of batteries needed to store the equivalent energy held in only a few litres of petrol being so great, the electric vehicle remains very much a “city” car. However, this type of vehicle can really score over alternative forms of powered, personal transport when the electricity used to top up its batteries is derived from sustainable or renewable sources. Anyone considering buying one of these cars would be well advised to look into switching to a greener electricity supplier first. Within the urban environment, the fact that these vehicles themselves have no emissions and are virtually silent in operation are major advantages, while from the owner’s perspective the cheap running costs and low maintenance are particularly attractive features. However, the flip side of these environmental paragons is that, despite good acceleration on the flat, they have a relative low top speed and their performance on prolonged inclines can be poor. In addition, the lengthy recharging times compound their problems of range, while the disposal of batteries at the end of their useful lives presents its own environmental questions. For mass car manufacturers, the thrust of current development seems to lie in hybrid vehicles and biofuel versions of mainstream production models rather than electric cars. While the current state-of-the-art electric vehicles are really only viable for city dwellers, never-the-less they do achieve the magic mix of personal independent transport, coupled with a serious environmental conscience – and the choice and availability is slowly getting better. Whether the electric car will ultimately become the norm within our urban landscape remains to be seen, but it has certainly come a long way in a fairly short time and when it comes to low noise/low emission transport at street level, it really is hard to beat.